January 2015 n Performance & Hotrod Business n 99 More suspicious was its email address, aptjournal.com. If you look them up, it asks you to enter your email address to "unsub- scribe." Clearly, there are plenty of examples of how unscrupulous individuals and com- panies can get your email address, and with it access to much more information than you would readily share with anyone. What to Do What should you do if your email is hacked? Check your email settings for links to your signature, or any forwarding of your email. Report to your email ser- vice provider that you were hacked, change your password and security questions. You'll also want to change the password on any site where you used the same one that was breached. If this isn't done, the problem will only become worse. Also: • Run updated antivirus software to ensure your mail account is clean before changing your password. • Send an email to all your contacts warning them of any suspicious emails that may be coming from your email address, and not to click on any links or attach- ments they may contain. BCC (blind car- bon copy) your contacts rather than using "To" or "CC" so that you aren't sending your list out to everyone. • Check your credit and all your bank accounts if they are accessible online for any fraudulent activity. 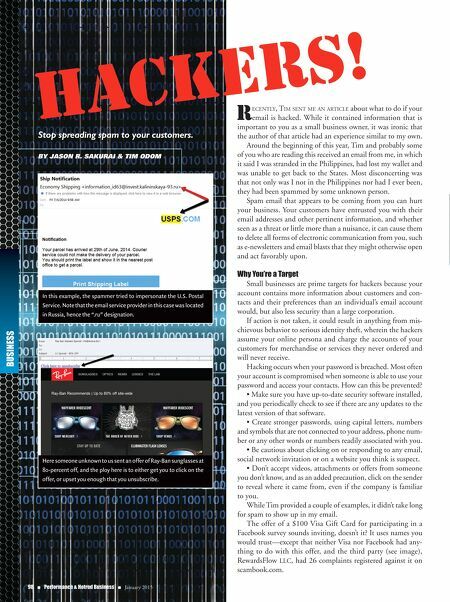 • Continue to remain vigilant, and remember that hackers may still have some of your information, or be in a position to cause you harm. I created a new email address that I use, even though I still retained the old one. Now I receive email or an inquiry at the old email address, but I respond whenever possible using the new email address. How do you prevent this from happen- ing again? Experts recommend you change your passwords frequently and make them as secure as possible. Think of passwords that are easy for you to recall, but aren't associated with your shop or home address—your birth- day, anniversary or kids' birthdays. Use capital letters, lowercase letters, numbers and symbols to vary your passwords, and don't simply change the number. If the hacker is successful in guessing a password in which you've only varied one number, how hard do you think it would be to go right down the line numerically and figure out that you ended the first with a "1" and your next account with a "2"? Be smart about the emails and offers that you open or to which you respond. 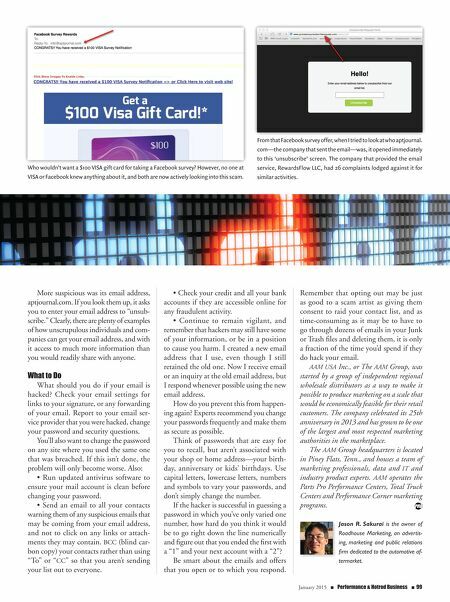 Remember that opting out may be just as good to a scam artist as giving them consent to raid your contact list, and as time-consuming as it may be to have to go through dozens of emails in your Junk or Trash files and deleting them, it is only a fraction of the time you'd spend if they do hack your email. AAM USA Inc., or The AAM Group, was started by a group of independent regional wholesale distributors as a way to make it possible to produce marketing on a scale that would be economically feasible for their retail customers. The company celebrated its 25th anniversary in 2013 and has grown to be one of the largest and most respected marketing authorities in the marketplace. The AAM Group headquarters is located in Piney Flats, Tenn., and houses a team of marketing professionals, data and IT and industry product experts. AAM operates the Parts Pro Performance Centers, Total Truck Centers and Performance Corner marketing programs. Jason R. Sakurai is the owner of Roadhouse Marketing, an advertis- ing, marketing and public relations firm dedicated to the automotive af- termarket. Who wouldn't want a $100 VISA gift card for taking a Facebook survey? However, no one at VISA or Facebook knew anything about it, and both are now actively looking into this scam. From that Facebook survey offer, when I tried to look at who aptjournal. com—the company that sent the email—was, it opened immediately to this 'unsubscribe' screen. The company that provided the email service, RewardsFlow LLC, had 26 complaints lodged against it for similar activities.